Increasing diversity in museum curatorship is the basis of a new initiative at Spelman College established through the support of a five-year, $5.4 million grant from the Walton Family Foundation. The Atlanta University Center (AUC) Collective for the Study of Art History and Curatorial Studies initiative will create a pipeline into art museum leadership and position Spelman, Morehouse College and Clark Atlanta University to be leading producers of African-American museum professionals nationally, Spelman officials said. A new Art History major and Curatorial Studies minor at the historically Black college will stem from the initiative. 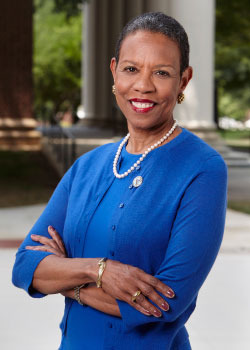 “The new grant will enable the AUC to make use of its exceptional resources in the form of the Spelman Fine Arts Museum, the Clark Atlanta University Art Museum and the Woodruff archives as well as the many resources in Atlanta to build a first rate program,” said Spelman president Dr. Mary Schmidt Campbell. “We applaud the foundation’s commitment to closing the diversity gap to ensure that leadership at the nation’s cultural institutions begins to reflect the shifting demographic profile of the communities they serve,” Campbell said. An increase in diversity of museum leadership will advance the “pioneering contributions” of Black museum administrators, said Dr. Melanee Harvey, assistant professor of art history at Howard University and a Spelman alumna. Currently, minorities hold only 16 percent of museum leadership positions, despite making up 38 percent of the U.S. population, according to a 2015 survey by the Andrew W. Mellon Foundation. This fall, AUC leaders will be planning efforts to enhance coursework in Art History and Curatorial Studies and work to raise awareness and attract students to the new courses and program. -Bringing in guest faculty members in art history for each academic year. Morehouse president Dr. David A. Thomas said the gift will enable Morehouse students and AUC peers to increase their knowledge in the arts and be competitive in top graduate programs in art and curatorial studies. Leaders in art, museum curation, education and philanthropy praised the gift and new initiative for the opportunities it will bring AUC students – a nurturing environment filled with mentorship, collaborations with prominent museums and experiential learning. Reflecting back on her Spelman experience, Harvey said the college gave her the skills and confidence needed in the field, leading her to pursue a Ph.D. in the History of Art and Architecture. “Spelman gave me the tools to be ambitious, prepared but most of all audacious and creative in thinking about art production and visual representation,” she said, adding that there are several generations of art historians, museum administrators and cultural influencers with Spelman degrees.